Service Rank and Number / Rheng gwasanaeth a rhif: Lance Sergeant No. 11603. Military Cemetery/Memorial / Fynwent milwrol: Giavera British Cemetery. Ref No Grave or Memorial / Rhif cyfeirnod bedd: Plot: 5. Row: F. Grave: 3. Country of Cemetery or Memorial / Gwlad y fynwent neu gofeb: Italy. Died in hospital of Influenza on Saturday 26 October 1918, aged 23 years. Walter Price Roberts was born in Rhyl, Flintshire in 1895. The 1911 Census shows that the family lived at 37 Sisson Street, Rhyl, Flintshire, North Wales. The head of the family was Edward Roberts aged 45, a House Painter. His wife Ellinor Roberts (nee Jefferson) aged 42 and their 7 (seven) children – Nellie Maud Roberts aged 21, a Domestic Servant, Jennie Roberts aged 20, a Laundry Maid, Edward Arthur Roberts aged 18, a Railway Porter, Walter Price Roberts aged 16, an Apprentice Bootmaker who was employed by Dean’s, Russell Road, Rhyl, Esther Annie Roberts aged 14, Herbert Roberts aged 8 and Mona Roberts aged 2 years. 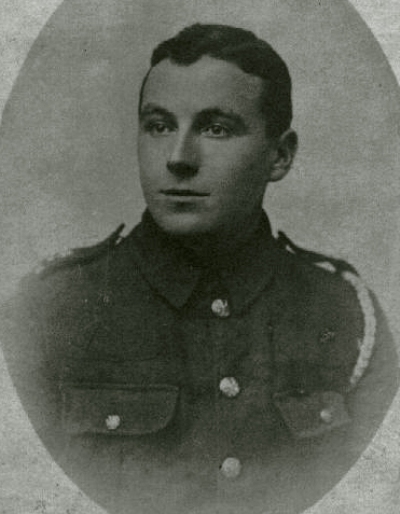 On Wednesday 12 August 1914, aged 19 years 5 months Walter enlisted with 1st Battalion, Royal Welsh Fusiliers at Hightown Barracks, Wrexham, Denbighshire. His Attestation Certificate – British Army WW1 Service Record can be viewed on (www.ancestry.co.uk). On enlistment he was described as 5’3″ tall, Chest Measurement 34″, Expansion 2″, Fresh Complexion, Grey Eyes, Brown Hair. Lance Sergeant 11603 Walter Price Roberts. His medal card tells us that his first theatre of war was Gallipoli which he left for on 28th June 1915. He was in the 8th Bn RWF at this time. They arrived on the 12th July. He served on the Western Front in France and was promoted Lance Corporal on 1 September 1916, Corporal on 1 December 1916 and Lance Sergeant on 16 June 1918. 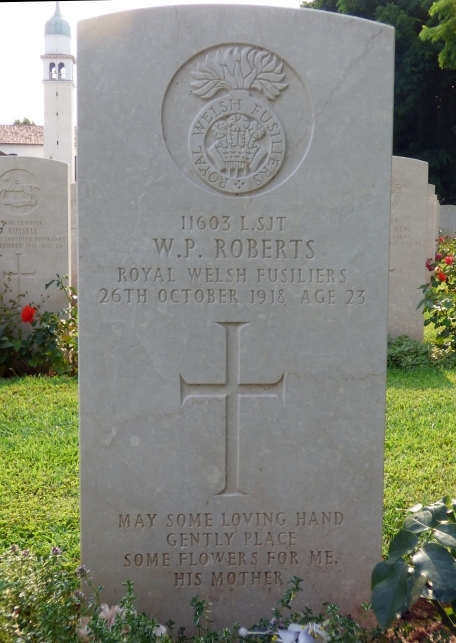 He died in a Military Hospital in Italy on 26 October 1918 of Influenza. On 13 September 1919, a payment of £42. 14s. 3d. was made by the War Office to Ellinor Roberts, which was made up of £17. 4. 3d, monies being owed to her son Walter and £25. 10s. 0d, War Gratuity.